REPRESENTATIVES of the Newnan Carnegie Library Foundation from Georgia in the United States of America visited South Ayrshire Council’s Carnegie Library in Ayr on a cultural exchange, to see the wide range of facilities on offer. A building in Georgia that was originally constructed as a library some years ago became a court of law. When the court moved to new premises and the building became vacant, local people decided that they wanted to reinstate the building as a library. Library enthusiasts held a number of fundraising events to purchase the building and return it to its former glory. The visitors from Newnan were welcomed to Carnegie Library in Ayr by South Ayrshire Council South Ayrshire Council and Councillor Margaret Toner, the Depute Leader of the Council and Portfolio Carrier for Community Services. The visiting party presented Provost Sloan with a letter from the Mayor of Newnan that explained the reason for the visit and brought greetings to the people of South Ayrshire. Tom Barclay, Local Studies Librarian at Carnegie Library and renowned local historian, gave the visitors a guided tour of the library and answered questions about our facilities. 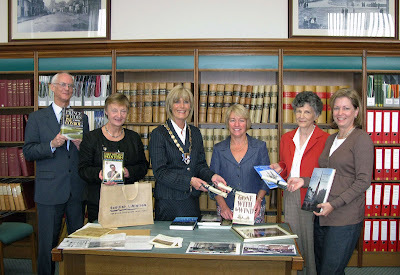 Councillor Margaret Toner accepted a copy of ‘Gone With the Wind’ from the Newnan visitors. As a memento of their visit, Councillor Toner presented the visitors with a copy of the ‘History of Ayr’. There are currently 343 Ayrshire business stories permanently archived on this site. To locate those of most interest to you, please use the site search facility in the top left hand corner of this page. Type your search term in the white box, then click “SEARCH BLOG”.